This is MBA project report on "Search Engine Optimization (SEO)", which refers to the techniques used to improve the page rank of any website in organic (or natural) search results, thus making your website more visible to the people who are looking for your products or services via search engines. 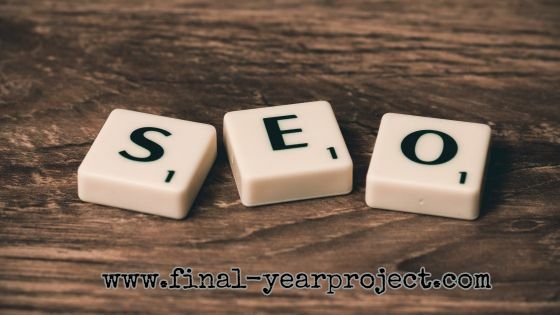 SEO is very vital to the success of any online business and should be done properly.You can also subscribe to FINAL YEAR PROJECT'S by Email for more such projects and seminar. SEO stands for ‘Search Engine Optimization’. It is the process of getting traffic from the free or organic listings of search engines. It basically comprises of ON Page & OFF Page activities. ON page & OFF Page activity involves many processes that help you to improve the websites page rank (PR), thus helps you to improve your web revenue by attracting maximum internet users towards your website. Google PR parameter is now deprecated. 1. Analyzing the website and to remove the errors to make it SEO friendly. 2. Optimizing each page of a website and targeting right keywords, thereby getting high ROI. 3. Updation of Meta tags for each page. 4. Competitor analysis and target customers. 6. Create and optimize content. SEO is a part of the broader topic of Search Engine Marketing (SEM), a term used to describe all digital marketing strategies for search. SEM entails both organic and paid search. With paid search, you can pay to list your website on a search engine so that your website shows up when someone types in a specific keyword or phrase. Organic and paid listings both appear on the search engine, but they are displayed in different locations on the page. Practicing SEO basics, as well as more advanced techniques after those, can drastically improve your websites ability to rank in the search engines and get found by your potential customers. Because the main aim of a search engine is to provide you with relevant and useful information, it is in everyone’s best interest (for the search engine, the searcher, and you) to ensure that your website is listed in the organic search listings. In fact, it is probably best to stay away from paid search all together until you feel you have a firm grasp on SEO and what it takes to rank organically. On-page SEO is a vital part of your overall search engine optimization strategy. These are the things which you can control and tweak to suit your end goals, so it’s crucial to understand what factors can help you get the desired results. On-Page optimization is absolutely necessary if you intend to improve your site’s visibility in the search engine results. Compared to on-page SEO, off-page SEO can certainly be more difficult to execute. Off-page SEO includes building relationships with other websites through the creation of attractive content or reaching out to the people who run the websites. This process is called link building. Who is linking to you, how they are linking to you, and how your content is shared in social networks and across the web are all factors that can have a significant impact on your ability to rank on the SERP. There are multiple benefits of SEO which are further explained in this project report. This MBA project report also includes steps in SEO, ON-OFF page SEO factors, long tail keywords, SEO project reporting, etc.